Rick Cnossen is the president and chairman of the Board for the Continua Health Alliances. 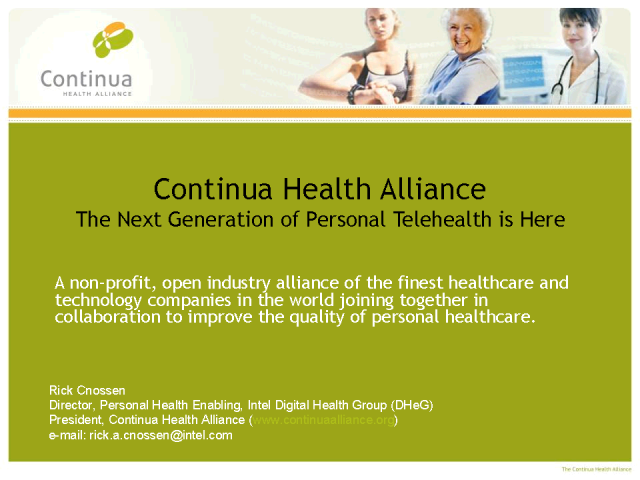 Continua is a large, international, cross-industry consortium, focused on the establishment of an eco-system of interoperable, personal telehealth systems. He is also a director of Personal Health Enabling for Intel’s Digital Health Group with a focus on medical device interoperability standards. Additionally, he serves on the HITSP Board of Directors and is a participating member of the ISO/IEEE 11073 Personal Health Data WG, the HITSP Consumer Perspectives Technical Committee, the Health Level Seven (HL7) Structured Document Technical Committee, the USB Personal Health Device WG, and the Bluetooth Medical Device Profile WG. Mr. Cnossen holds a MSCS degree from the University of Southern California (USC). He worked at McDonnell Douglas (Boeing) for 15 years as a Software Engineering Manager on a variety of Aerospace and Defense projects and at Intel Corporation for 9 years as an Engineer Manager and Director. During this time, he has been involved in many industry technology and standards development efforts including Advanced Telecommunications Architecture (ATCA) Manageability Specification, Tactical Defense data collection / analysis, Hierarchical Data Assimilation and Storage, and High Performance Computing.